Paul Grimley Kuntz was a deeply religious man who not only found religious profundity in the Decalogue but also was convinced that it offers the most reasonable paradigm for a well-ordered society. Decrying the loss of the true meaning of the Decalogue in modern times, Kuntz spent the last decade of his life preparing this book, his magnum opus, on the Decalogue. In his research and writing he left no stone unturned, considering the Decalogue and the history of its use from every conceivable angle. In The Ten Commandments in History Kuntz passionately argues that the Ten Commandments are universal principles of social order that have to be applied in concrete circumstances in order for their meaning to be fully understood. In a nearly seamless discourse about the tradition of the Ten Commandments, Kuntz engages the thought of more than twenty philosophers from antiquity to modernity, showing how great minds adapted the Decalogue to the needs of their particular age. Among the figures treated in the book are Philo, Aquinas, Wycliffe, Luther, Calvin, Hobbes, Locke, Edwards, Kant, Jefferson, Montaigne, Pascal, Hegel, and Nietzsche. By demonstrating the crucial role of the Decalogue in the history of ideas, Kuntz hoped that readers would find a new reverence for the Ten Commandments and once again value their place in civil society. Foreword by Marion Leathers KuntzPaul Grimley Kuntz was a deeply religious man who not only found religious profundity in the Decalogue but also was convinced that it offers the most reasonable paradigm for a well-ordered society. Decrying the loss of the true meaning of the Decalogue in modern times, Kuntz spent the last decade of his life preparing this book, his magnum opus, on the Decalogue. 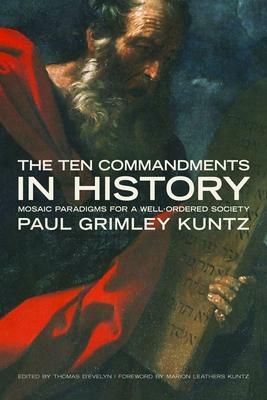 In his research and writing he left no stone unturned, considering the Decalogue and the history of its use from every conceivable angle.In "The Ten Commandments in History" Kuntz passionately argues that the Ten Commandments are universal principles of social order that have to be applied in concrete circumstances in order for their meaning to be fully understood. In a nearly seamless discourse about the tradition of the Ten Commandments, Kuntz engages the thought of more than twenty philosophers from antiquity to modernity, showing how great minds adapted the Decalogue to the needs of their particular age. Among the figures treated in the book are Philo, Aquinas, Wycliffe, Luther, Calvin, Hobbes, Locke, Edwards, Kant, Jefferson, Montaigne, Pascal, Hegel, and Nietzsche. By demonstrating the crucial role of the Decalogue in the history of ideas, Kuntz hoped that readers would find a new reverence for the Ten Commandments and once again value their place in civil society.